There are still tickets to the two student days at USC Sunshine Coast, but there are also a range of Voices Plus events that may interest many SCBWI members. Free workshops with Nick Earls (Maroochydore Library) and Mandy Ord (Cooroy Library) on Wednesday 19 July. Bookings essential. Full session details and bookings can be made on the website: www.voicesonthecoast.com.au. Or telephone the Voices office on 5477 3437 to book tickets. 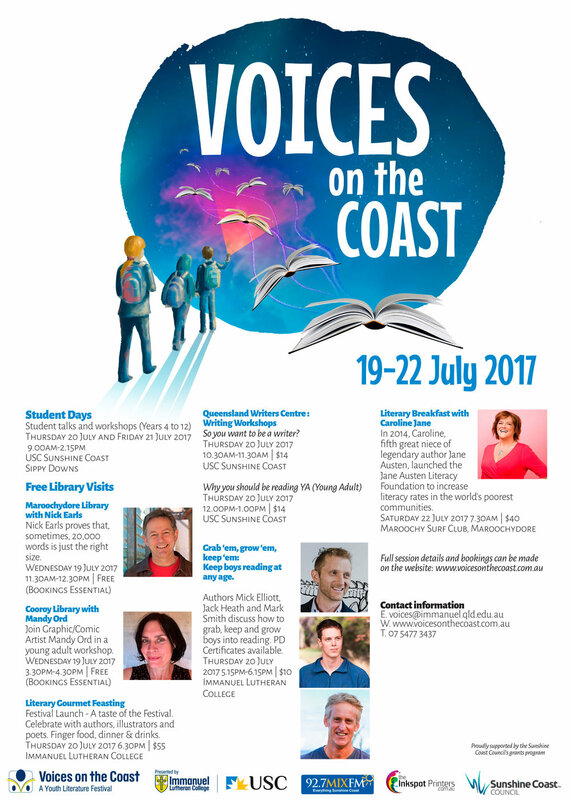 Volunteering – if you would like to be a volunteer for the student sessions for Voices on the Coast please contact Kelly in the Voices office. This is a great opportunity to listen to author sessions across the two days. Tasks include taking tickets at the door for each session and then attending the session as an adult supervisor.